If you have multiple card readers, a card reader with multiple slots or just want to tweak your copy performance you may simply increase the number of files that are copied in parallel, since Silverstack is capable of doing multiple copy jobs and tasks at once. When we talk about multiple tasks, we are referring to multiple cards copied at a time. Multiple jobs are the different files stored in the cards. A good starting point if you are not familiar with the innards of data-transfer would be reading the article “Factors for data transfer performance”. By default Silverstack copies files and clips successively. We have also some hints on how you can improve your performance by reading the article “Analyzing and improving data-transfer performance”. Do you have multiple copy jobs to be done simultaneously because you have more than one card-reader ? In order to change the number of parallel tasks done by Silverstack you have to go to general preferences and modify the value in «Number of parallel jobs» (figure 1). The selection “1 (Optimized, Recommended)” will copy sequentially in alphabetical order while small files will be copied last to optimize the copy process. Selecting “1 (Strictly Sequential)” will copy files in alphabetical order without regards to file size. Please note that your destination(s) should provide the necessary bandwidth. A slow destination (such as a USB2 drive) could result in a reduced overall performance. Therefore if you have not read the article about data-transfer performance and you are not familiar with it, then this is the best way to avoid frustration and weak performance. Do you want to tweak the copy performance? 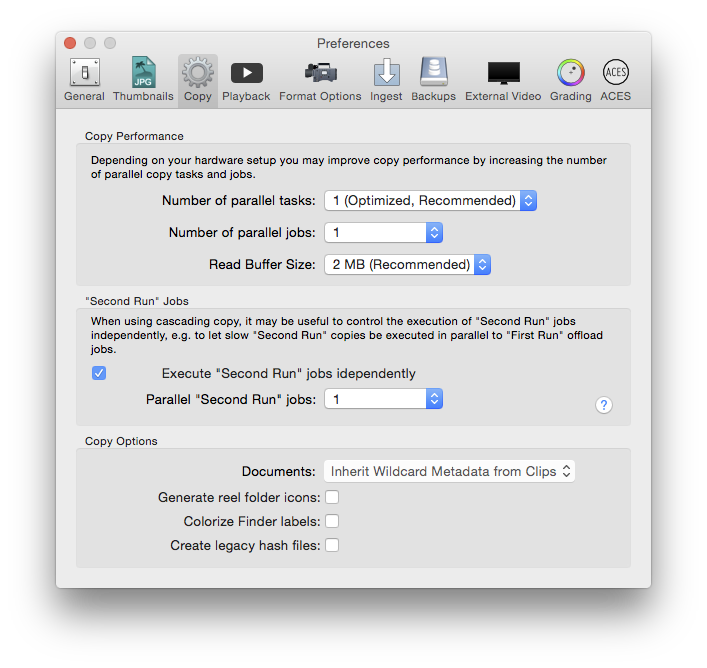 Simply modify the value in «Number of parallel tasks» (figure 1) in order to be able to increase the number of simulaneous copy jobs in Silverstack. Usually a value of 1 – 3 is suitable. Please note that due to hard disk mechanics you can not set that number too high because otherwise this will cause a performance penalty (depending on your personal hardware). If you encounter any problems reset the value to 1.